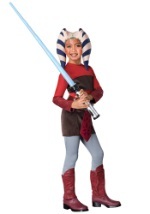 Become an important resource for the Jedi in this deluxe ARF trooper costume for kids! The licensed costume includes a black, polyester jumpsuit that velcros in the back for closure. The front is covered in white and grey molded EVA armor while the back is screenprinted to match. Polyfoam boot covers are also attached and are secured in place with elastic and velcro. A grey molded belt made from latex ties around the waist and a two-piece helmet tops the look off. The helmet is made from plastic and held together with durable velcro. 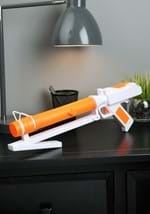 It is painted white with grey accents and has a clear visor and slits for breathing. Great paired with our Clone Wars Rex, Cody and Fox costumes!